THIS IS THE WILD AND SCENIC ROGUE. There is one downfall to a Rogue River expedition - it is nearly impossible to get a good night's sleep when camping at the put-in. This is a place you simply can't wait to explore- where every turn offers something new and exciting. In the calm stretches, you'll be mesmerized by the canyon's banks made of dark rock whose shapes and curves have been sculpted by the clear turquoise water. Towering over them is one of the most beautiful old growth forests in North America - a unique mix of gigantic firs and twisted, red madrones that filter the streaming sunlight in a way that captures and keeps your attention. When rapids approach, you'll peer into the river and be momentarily hypnotized by the cobblestone bottom that seems to shoot past you upstream as you ride the glassy tongue of water like a magic carpet into one of the countless class III rapids that make the Rogue comfortably challenging. You'll look forward to the excitement of Mule Creek Canyon - a mile-long stretch where the Rogue channels into a narrow basalt chasm not much over 20 feet wide in some areas, churning the river into a spirited and energetic stretch which culminates in a seemingly private room walled off from the rest of the planet called "The Coffee Pot." Sections like this, and the famous "Blossom Bar" rapid will keep your pulse rate high, but for the most part the Rogue is a place of inspiration and wonder. Some days you'll enjoy a side that will make you feel like you've just stepped onto the set of "Lord of the Rings". Others you'll spend so much time swimming in the warm, clear water that you'll swear you're starting to grow gills. And others, you might just enjoy some downtime on one of the Rogue's beautiful beaches watching osprey dive for fish or keeping an eye out for a black bear and her cubs to lumber past on the opposite bank. We only wish that the Rogue was a longer expedition...be sure to take in every mile while you're there! Day 1. Travel day. Meet at Denver International Airport 2 hours prior to flight departure for our flight to Medford, OR. In Medford, we’ll rent vehicles and drive just about one hour to about an hour to our campsite for the night at Alameda Bar. Once camp is set up, we’ll introduce ourselves to the Rogue” with a cooling afternoon swim right, then head to the beautiful deck at nearby Galice Resort for a dinner overlooking the river. 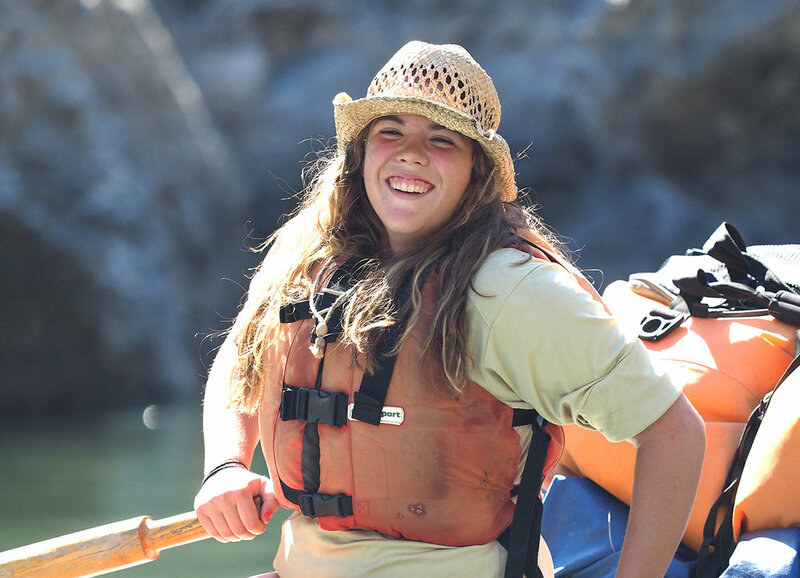 Upon returning to camp, we’ll meet the rest of our professional guide team and begin exploring the GOALS curriculum before drifting off to sleep with the sounds of a crackling campfire and rolling river filling the star-filled air. Map of the Wild & Scenic Rogue River - compliments of our partnering outfitter, ARTA rver trips. Day 2. Rainie Falls and a historic cabin. 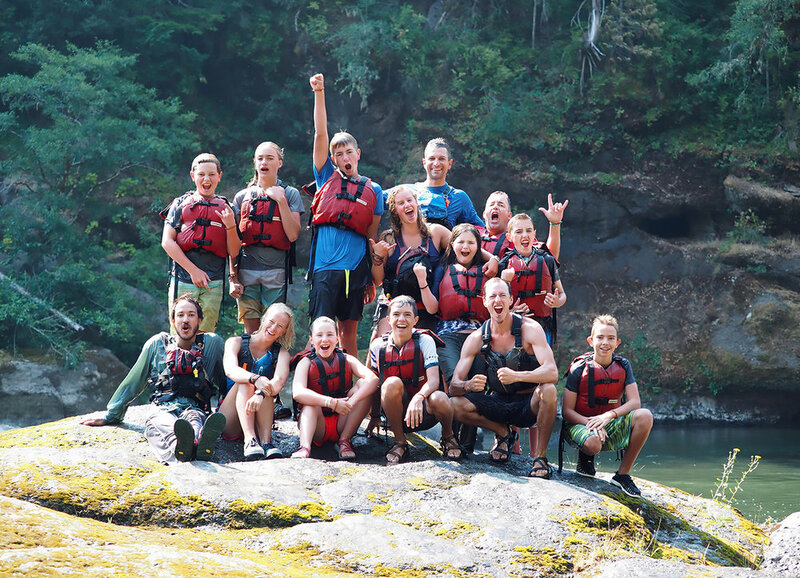 Today, we’ll wake up excited to being our downstream journey exploring the magical Wild and Scenic section of the Rogue River. The day begins with some fun, splashy class III rapids, and soon we find ourselves at the impassable Rainie Falls. The group will portage around Rainie - admiring the size and power of the falls - while our guides skillfully lead the boats through a set of salmon ladders next to them. We’ll enjoy a celebratory lunch after getting all of our gear through the salmon ladders, then continue downstream toward this evening’s camp. Just before arriving, we’ll pull over at Whiskey Creek and hike to an old miner’s cabin, enjoying our first hike through the coastal forest ecosystem that is so unique to the Rogue - a mix of verdant ferns, towering old growth pines, and smooth, twisted madrone trees. By the end of day 1 on the Rogue, our minds are running full speed - imagining what might lie downstream in the coming days! Day 3. Tyee, Wildcat, Black Bar, AND Kelsey Canyon! Today is a action-packed river day - beginning with two significant rapids just past camp named Tyee and Wildcat. 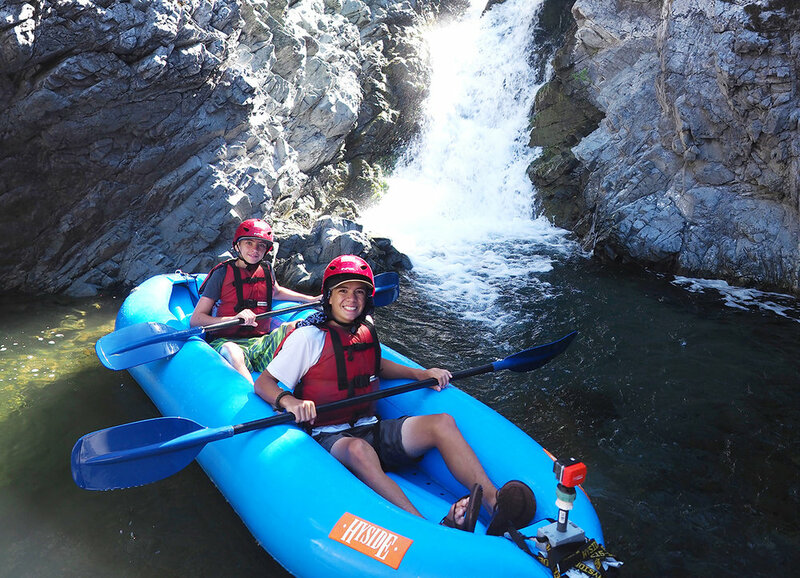 After successfully navigating this pair, we arrive at Lower Black Bar rapid - a fun rapid that our most adventurous participants enjoy swimming through - giggling as they splash through the big waves. Below Black Bar, we enter Kelsey Canyon - a seemingly endless string of Class II and III drops and rapids that couldn’t be mush more fun in a ducky. We’re aiming to camp near the beautiful Rogue River Ranch tonight, which will set us up for an absolutely incredible layover day tomorrow. Day 4. Layover at the ranch. Assuming we’re lucky enough to grab a campsite at the ranch, Day 4 on the Rogue is tough to beat. Well…until day 5. Our day 4 schedule is more terrestrial than aquatic. After coffee and breakfast, we’ll enjoy an amazing hike to Inspiration point - looking down from a bluff above into the mystery of Mule Creek Canyon. From this vantage point, we’ll do a bit of scouting for this section that we get to navigate tomorrow, then hike back toward camp. Arriving late morning, we can relax and spend some time writing and drawing in our journals, or organize a pre-lunch game of kickball in the huge grassy field that separates the river from the ranch. Either way, when the heat of the day arrives, we’ll embark on another short hike to one of the most incredible tucked-away swimming holes anywhere - complete with a small jump rock and a long stream to explore which feeds the pool - sometimes walking, sometimes wading, and sometimes swimming through its’ varying depths. As afternoon turns to evening, we’ll pull out a guitar, start a campfire, and talk about day 5 on the Rogue…about the only thing that can top day 4! Day 5. Mule Creek Canyon, Blossom Bar, and Huggins Canyon. If rivers have emotions, then today we experience their entire gamut. Our day begins in Mule Creek Canyon, where the entire river narrows to a width of less than 20 feet between towering rock walls and the water becomes turbulent and powerful. Mule Creek Canyon is equal parts beautiful, intimidating, and mysterious - a mile-long stretch of river unlike any other stretch most river runners have ever seen. After navigating it’s currents and squeezing our boats through successfully, we’ll celebrate at Devil’s Staircase, a series of small waterfalls - before pushing downstream toward Blossom Bar- the crux rapid on the Rogue. For safety reasons, all participants will hike around Blossom Bar - watching the guides navigate the enormous rock garden that Blossom Bar presents. Under Blossom, we’ll enjoy lunch, pull over for a cliff jump or two, then head toward camp at Solitude - a beautiful and appropriately named large campsite where tall grasses blow in afternoon breezes as Solitude rapid flows right past. This is our last night together in the canyon, so we’ll pause for a short solo and compose a thank-you letter to the canyon - a tradition of every GOALS trip - before coming together for a silly costume night around the last campfire. Day 6. Tate Creek and the coast. About half way through our last day on the river, the character of the Rogue changes from a forested river canyon to a wider coastal river system. Right around the transition point, we enjoy one more side hike - a favorite among many Rogue explorers. This one walks up Tate Creek to a natural water slide created by years of water carving its’ way though the rocks, and ends in a large pool that is generally teeming with salamanders who enjoy swimming in its’ cool waters with us. All good things must come to an end, so we’ll be a bit sad to arrive at the take-out, where we’ll load gear on trailers and give hugs to our guides. The sadness of our river trip coming to an end will soon be overshadowed by our excitement of driving out to the coast - just 30 miles or so west - and exploring tide pools, watching for seals, sea lions, and possibly even migrating whales. We’ll camp or stay in state park cabins on the coast tonight, enjoying an ocean sunset and one more night together before heading one last exciting day tomorrow. Day 7. Redwoods and home. This morning, we’ll take advantage of one final opportunity to experience a setting that we don’t get to see everyday - hiking through the old-growth coastal redwoods in Jedediah Smith State Park. After our hike, we’ll drive about 2 hours toward Medford for our return to Denver - generally arriving between 6 and 8pm. GOALS all-inclusive rates go beyond the unrivaled on-river experience. They also include all transportation, (ground and air), lodging/campsites before and after the expedition, and all meals both on the river and on the road during our travel to/from the canyon. A detailed outline of all inclusions (gear, government fees, supplies, etc.) is listed below. Round-trip airfare from Denver to Medford, OR (in some cases, Portland or Sacramento). Ground transportation from scheduled airport to river put-in and from take-out back to the airport. Campsite at Alameda Bar - Oregon State Parks on night 1. Vehicle shuttle from put-in to take-out locations. Campsite near Crescent City, California on night 6. All launch fees and government use fees for the Wild and Scenic Rogue River. A week of wonder of one of the western United States most beautiful rivers - accompanied by tide pools and redwoods!